Peyote has been the source of much controversy ever since European explorers encountered it during the 16th century. Today, recreational use of the drug is prohibited. Peyote use is exempted in the context of religious ceremonies conducted by the Native American Church. If you are interested in taking an objective look at peyote and its history, cultural use and health implication, you will find a wealth of information here. What is Peyote? A basic look at the cactus responsible for producing mescaline. History of Peyote: This piece provides a comprehensive history of peyote, from the days when it was considered a tool of the devil by the Catholic Church to the legal battles it faced from the United States government. Chemical Makeup: A scientific look at the chemicals that affect the brain when peyote is consumed. How is Peyote used? An overview of the various methods for consuming peyote and mescaline. Cultural Use: Learn more about how peyote has played into popular culture, including music, movies, video games and literature. Peyote Ceremonies: This article gives a thorough description of the Native American ceremonies and rituals in which peyote is used. Recreational Use: Recreational use of peyote is banned, but there are plenty of people happy to skirt that particular law. How and why do people use peyote on a recreational basis? Health Risks: Is is safe to use peyote? 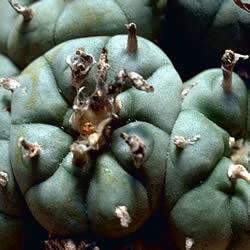 Read more to find out the potential health risks surrounding peyote. Long-term Effects: Research shows that Native Americans using peyote for religious reasons do not experience long-term health effects from the drug. Legality of Peyote:Using peyote is only legal under a specific set of circumstances. Famous Court Cases: In these Supreme Court cases, the justices had to decide whether peyote ceremonies were protected under the First Amendment. Peyote Artwork: There is a whole genre of Indian art known as peyote artwork. Religious in nature, the creations of peyote artists are inspired from visions experienced while consuming the drug. Peyote Beading: Although it did not originate with the peyote tribes, this type of beading has impressed bead artists all over the world. Famous Peyote Users: What did Jim Morrison, Aldous Huxley and Ken Kesey have in common? They all used peyote.